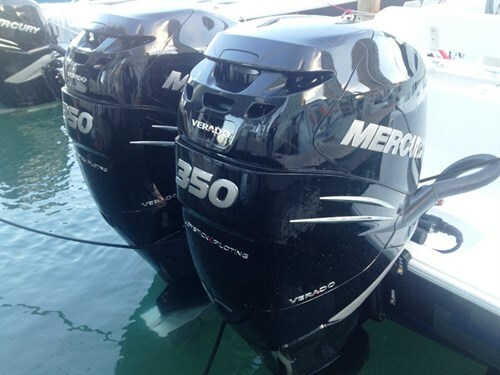 400hp Mercury Racing engines: straight to the Miami Boat Show. Cutaway of the 9lt quad cam V8. Check out those turbos! Fitting the valve train assembly to an L6 Verado engine. Mercury’s recently released new-model petrol sterndrive, the innovative 4.5L MerCruiser 250 V6. Showing the thickness of a gearcase drive gear. Steel and stainless steel are friction welded to make prop and drive shafts. Mercury Racing’s new 9lt quad cam 1550 Sterndrive has two fuel calibrations. Just switch to race fuel for 1550hp or back to 98 RON and 1350hp for pleasure boating. Take our word for it: make yourself a cuppa and follow Engine Man’s visit to the Mercury Marine factory. Anyone with even the slightest interest in boats will find this fascinating. So just how are outboard engines made? 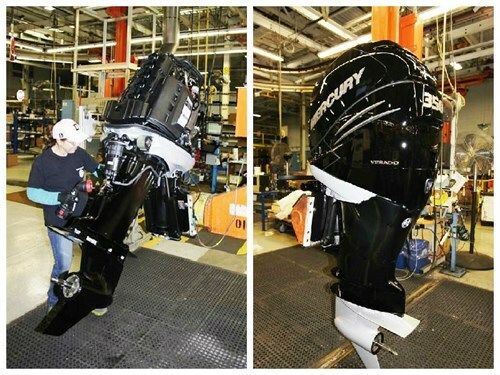 For countless years I've wanted to see how Mercury Marine makes its outboards and other engines. So when its Aussie division, Marine Power International, gave me the opportunity to spend a couple of days meeting the Mercury engineers and observing manufacturing processes, I would have been out of my tiny little mind to say no! Last year was the 75th anniversary of Mercury outboards, a company established by Carl Kiekhaefer in Cedarburg, Wisconsin in 1939. From there the company expanded in leaps and bounds thanks to innovative war machinery, moving to its current Fond du Lac (French for "at the bottom of the lake") location near Lake Winnebago, Wisconsin's third largest lake, in 1946. Mercury established several firsts, including through-propeller hub exhaust and CD ignition and, in 1961, the year it was absorbed by the Brunswick Corporation, released the world's first commercially viable sterndrive engine. In 1971 the company changed names from Kiekhaefer Corporation to Mercury Marine, which it still trades under. Other Mercury manufacturing facilities include Juarez in Mexico, St Cloud in Florida and a remaining engineering connection with the old sterndrive facility in Stillwater, Oklahoma. Mercury's Ron Bates showed me the engineering division, where Mercury engines are tested in closed cells for shift reliability and longevity. The testing goes over extended duty cycles, and includes such things as running an engine at Wide Open Throttle for 300 hours or more with props modified to maintain constant loadings within Mercury's recommended WOT rpm range for each engine. They are also evaluated in a variety of conditions, such temperature and moisture extremes. 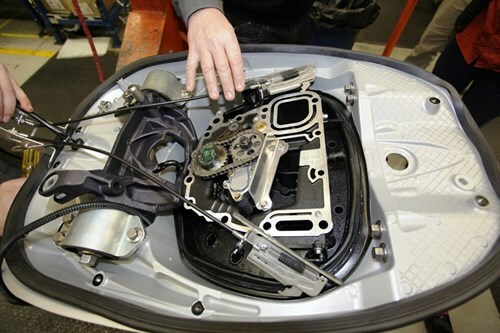 Mercury also has a non-destructive test facility where components from outside suppliers are measured and checked for compliance with the rest of an engine's assembly process. As Timothy Kaiser of the facility pointed out, it's up to the suppliers to meet Mercury's requirements. Balance shaft components are sourced from Australia. To meet US EPA emissions regulations, Mercury has a scrubbing system that removes 98.6 per cent of pollutants before they reach the atmosphere. Where possible, leftover alloys and steel used in the manufacturing processes are recycled. Mercury adopted ‘lost foam’ casting in 2001, which has dramatically cut casting and machining time. Mercury's Bill Hesterburg took me through the steps from raw form to cast engine blocks, cylinder heads and exhaust systems. 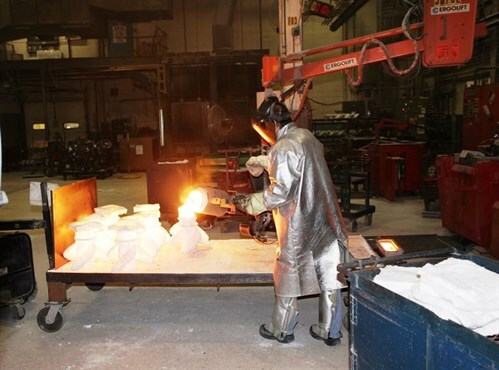 An outside supplier moulds the components in Styrofoam to Mercury's specifications. These components look nothing like a foam coffee cup and can have an incredible degree of complexity. These are then dipped in a thixotropic (no drip) slurry, before they dry for 24 hours. All cavities are filled with sand and are then moved to the alloy pouring area. A mix of alloys including magnesium are poured into the moulds and, after quickly vaporising the foam, fill all the cavities. The castings are then baked at 70psi (or five bar) then sent to a checking area. Pour to cast takes about 90 minutes. The castings are re-heated to almost melting point to increase strength, at the expense of some ductility. After quenching and removing any sand left in the cavities, the cylinder blocks are re-heated to allow insertion of steel cylinder liners, which are honed with a 60 degree cross hatch pattern to retain lubricating oil. These liners can also accept up to four oversize honings. Mercury manufactures over 500 different propellers. A tour through the propeller facility shows just why Quicksilver stainless steel propeller are more expensive than the competition. Mercury's Justin Ericson explained that Mercury Marine also casts parts for electric car manufacturer Tesla and John Deere's ATV division. The propellers are initially formed from a mix of wax beads that are 20 per cent polystyrene, which are then dipped in a slurry of silica sand before being dried for around two hours. The props are baked in an autoclave at 120psi and 250oC, then cast with the stainless steel mix. 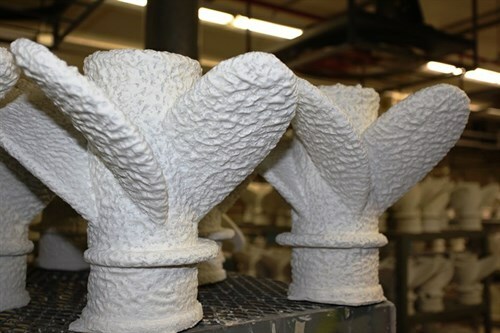 After cooling, they are shot-blasted to remove any remaining sand and polished in a rotating drum. Every propeller is checked for correct balance before being boxed and shipped. Mercury has three assembly lines, of which the Mercury Verado one is the newest. Mercury's Robin Senger, who accompanied me for the entire factory tour, showed every aspect of assembly. Mercury engines are assembled by teams with components checked on a computer screen before being moved to the next station. When the engines are completed, they are given a ‘dry’ run up to 1100rpm to check for any binding. Once the engines are mated with the pan, leg and lower unit, *every* engine is run in a test tank for seven to 10 minutes through a range of rpm including one minute at WOT. All Mercury Verado engines are shipped with semi-synthetic break-in oil, which is changed at the first 20 hour service with follow up intervals of every 100 hours or annually. Non-racing sterndrives such as the recently released Mercury 4.5-litre V6 250 and 200 are also assembled. Separate from the main Fond du Lac factory and up the hill from Carl Kiekhaefer's family home (kept as a memorial since his death in 1983) is the Mercury Racing Division, which assembles the 8.6-litre sterndrive engine, the 9-litre racing engine and the Mercury OptiMax 225, 250 and 300 XS engines. The division also assembles an OptiMax 185 that can run on a range of kerosene-based fuels including JP5, JP8 and JetA. According to the division's Rick Mackie, these are primarily for military use. And of course, there’s the Mercury 400. Thanks Robin Senger for all your patience with my endless questions and constantly slowing down the tour by having our photographer capture every little detail. See the full version of this review in Trade-A-Boat #463, March / April 2014. Why not subscribe today?